This past Monday at 5:55 am, I was on a plane, on my way back to Toronto. I was awakened by the voice of the captain, who asked the flight attendants to prepare for landing. A minute or so later, the plane shook violently and there was a rapid change of cabin pressure. The emergency oxygen masks were subsequently released from the ceiling. For the next thirty seconds, passengers were screaming, the flight attendants were asking us to remain calm, and the flight captain was assuring us that it was going to be a safe landing. All I could think about was that we were going down. I cannot say my life flashed before my eyes, but I did think of some people I love and care for. This event certainly gave me lots of food for thought and prayer. Thankfully, we did land safely. As the plane was taxiing to the gate, we were informed that there was a medical emergency (someone had a heart attack in the midst of the turmoil) and we needed to wait until the paramedics tended to our fellow passenger before we could get off the plane. Perhaps in an attempt to distract us during the wait, the captain casually commented: “In other news, the Pope resigned this morning.” Some thought the captain was making an attempt at humour, but I instinctively knew that he was telling the truth. In fact, I totally forgot about the paramedics and everything else. All I could think about was the Pope's resignation. As we awaited for the ailing passenger to be taken away, I thought about the Holy Father. My mind started to wonder about the context of his resignation and the future of the Church. Throughout the day, I had the opportunity to get more information on what was happening in Rome and to read many reactions to the Pope's resignation. I also took some time to pray for him and for his successor. Benedict XVI's resignation trended on Twitter and Facebook all day long, while television and radio commentators were discussing the news ad nauseam. Bloggers and pundits offered their opinions about what this meant for the Pope, for the Papacy, for the papal conclave and for the Church. Many opined and remarked about the Pope's greatest achievements, and where the Church and his Papacy had fallen short. I quickly grew tired of the analysis and the criticism, and started to reflect on what the Holy Father's resignation meant for me. With this, allow me to share the fruit of my reflection on the Pope's decision. I heard and read many comments by people who lauded the Pope's decision to resign. They claimed his choice was selfless and noble. A good friend of mine jokingly contrasted it with LeBron James' decision, which was self-serving and egoistic in its nature. In his resignation statement, His Holiness admitted that he lacked the strength of mind and body to fulfil his ministry. In doing so, he acknowledged his vulnerability and he taught us a valuable lesson. Benedict XVI has always been a teacher, and a good one at that. He admits that being a teacher has always been an important part of his vocation and his ministry. Someone once told me that people used to flock to see Pope John Paul II, but they congregate to hear Pope Benedict XVI. One only needs to attend one of his Wednesday audiences or read one of his books to realize what an amazing teacher he is. In his decision to resign as the Bishop of Rome, the Pope is teaching the value of acknowledging our own frailty and vulnerability. Through his actions, he is instructing us to accept ourselves as we are. He is showing us that it is alright to let down our guard. What good does it do for us to praise the Holy Father for his actions, when we are constantly attempting to appear strong, talented and knowledgeable? When we rid ourselves of the walls we build around us, we allow others in, we invite them to do likewise. In that process, we learn to accept one another as we are. We gain incredible freedom and we experience healing. In light of this historical moment, I feel drawn to assess and rethink the way I live with my own frailty and vulnerability. I am called to reflect about my need for humility and meekness of heart. This invitation comes at a perfect time, for today, Ash Wednesday, is the beginning of Lent. I think that the Pope had thought about the timing of this decision. It witnesses to the reality of Lent. 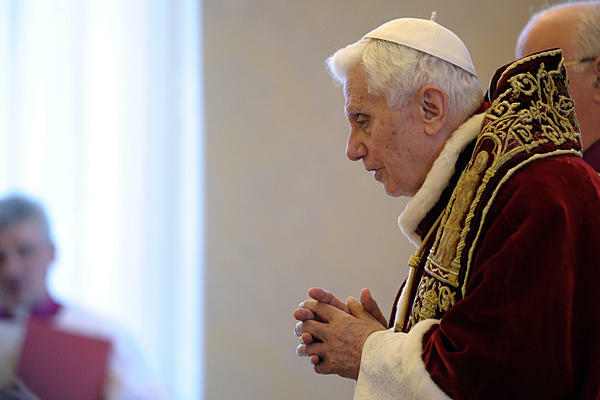 In resigning and accepting his frailty and his need for prayers, Benedict XVI is testifying to the reality of this liturgical season. As my mind wonders about the future of the Church and about the successor of this great teacher, I am in awe of the timing of this decision. For the Pope is asking us to fast and pray. He is inviting us to recollect and to pray for the Church. He knows, a little too well, that the election of a Pontiff is not a political process, but a spiritual happening. Thus, he calls us to pray for the Church and as a Church. He reminds us that Lent is the best time to ask for spiritual freedom. He displayed that freedom in his decision to step down. He is asking us to pray and to fast, in order to acquire spiritual freedom as we prepare for the election of the new Pope and for the celebration of Easter. Both celebrations require that we free ourselves from our attachments and agendas, in order to be able to follow the will of God, to continue discerning and building the Kingdom of God. I am grateful to Benedict XVI for his great service to the Church. I am grateful for his reminder that “I must decrease while he must increase” (John 3:30). I am grateful to God the Father for the gift of this servant of the servants of God. I am thankful to Jesus for the mission he has entrusted to all of us in the Church; a mission the Pope has fulfilled so well. I am grateful to the Holy Spirit for the way the Holy Father was inspired to teach, to love and to serve, and for the way the Spirit drive us into the desert of this Lenten season to prepare spiritually, to discern and to build the Kingdom of God. Great post! Thanks for the reflections, I think this was a very heart-felt examination of the Pope's decision. One who has power, I believe, is not really free, as power comes with responsibility. When one gives up that power, and the responsibility that accompanies it, then one is truly free. Santi, by reading your post I can tell you like Benedict. I personally have a lot of problems with his Papacy. How can I discern my feelings and thoughts about him and the Church right now? Thank you FC. Anita, discernment is a process of sorting your thoughts, feelings and desires. Remember that it is about becoming aware of them, trying to understand them (seeing whether they are leading you to God or away from him), and accepting the good or rejecting the bad. I think you need to bring your thoughts on him to prayer and try to understand why you feel about him the way you do. What is causing you to feel or to think that way? This is not an easy process, but you might want to bring that to your spiritual director. I heard he is an amazing guy. Cheers. I must admit that I am prone to getting caught up in trying to analyse everything through a political lens. I appreciate the reminder that the Popes decision has a spiritual dimension that is perhaps more important than the politics that I get hung up on, and furthermore that this spiritual dimension can bear fruit in my own life, if I let it. I wonder what roles of authority I need to hand over to God this lent?